The Acorn Library is a free, self-service children’s library in Washington Grove. It contains over 2,400 volumes including toddler books, picture books, easy readers, fiction, poetry, humor, anthologies, reference books, science, history, biography, sports, and holiday books. There is also a large collection of children’s magazines which are available to be used and cut up for school projects, etc. The library is housed, courtesy of the Klinger family, in two rooms of a green-roofed garage near the corner of Center Street and Maple Road. Look for the Acorn Library sign (carved and donated by Mrs. Gary Gordon) hanging from the windowbox. 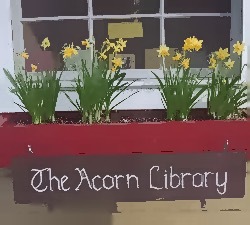 Acorn Library is self-serve and is available for use at any hour on any day of the year. If you find the door locked, there is an easy-to-remember code that opens the lock. Call Betsy at 301-977-3517 if you need the code. The knob is difficult to turn and often seems to be locked. If you have trouble, pull the knob toward you and turn hard to the right. If you are a new user, you may borrow three books at a time. You will find a file box of index cards on the desk. List your name and phone number on one and use it to record the date and the names of books you borrow whenever you visit. Strike through the titles you have returned. There is no due date, just a limit on the number of borrowed books you may hold from the library at one time. Regular visitors may borrow six books. The library was initiated and is sustained by participation of the Town’s children. It was founded in August 1996 by Grace Ambrose, Jane Klinger, Naima Ritter, Yihana Ritter, Danielle Helme, Emily McCathran, Alexander Lembesis, Merida Anderson, and Joel Shapiro, with Betsy as facilitator. The group painted shelves, sanded bookcases, made labels, and brought in rugs, curtains and chairs to prepare the space. They then pooled their books and wrote the rules. They staged a grand opening in September, 1996 with a puppet stage, baked goods, and story telling. Since then, more than 40 families have donated books for the library. For the first year and a half the children held weekly story hours, with the older children and adult guests reading to younger children. Acorn Library still welcomes any children or parents who wish to use the space for weekly gatherings or for special events! Since 1998, The Woman’s Club of Washington Grove has generously donated funds to help pay for electricity. Thanks to them, the library is usually lighted and in winter, heated, Sunday through Tuesday. However, children are encouraged to come use the library (and turn on lights or heat) at any time. Call Betsy Klinger at 301-977-3517 or E-mail to [email protected].